Everything else is just average: planned with enthusiasm, this decorative birdhouse HEXAGON Redondo Villa Montana Cages from the Casa series enough space for small feathered pets to run around, climb and play. 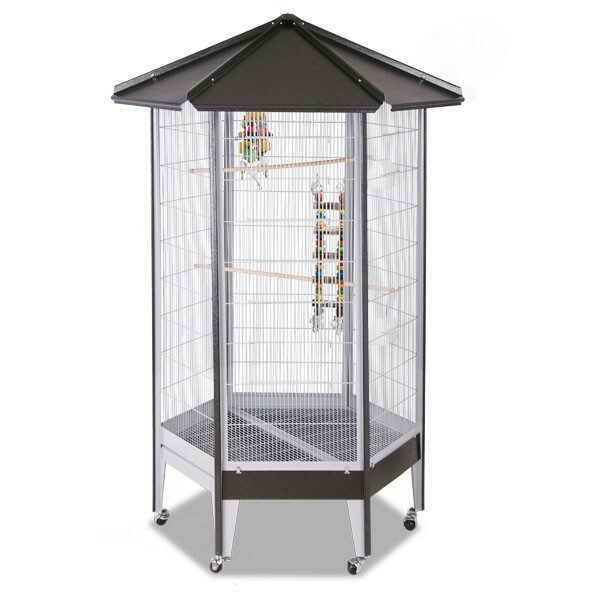 In addition to perches this model is supplied with food and water bowls. Due to the stable feet with rolls it can be pushed around comfortably once on the patio or balcony. The very latest in the classic color combination Antique / Platinum and the new trend color Choco / Vanilla and in ruby / vanilla available. Modifications or variations are possible here because of the production. We ask you to consider that an accurate indication of these units is unfortunately not possible. links "Hexagonal Aviary Villa Redondo - Antique/Platinum"
customer reviews on "Hexagonal Aviary Villa Redondo - Antique/Platinum"
super geeignet auch für Wellensittiche. einfacher Aufbau und tolle Farbe.